Thelightest exoplanet yet discovered ? only about twice the mass of Earth ? hasbeen detected, astronomers announced today. "Withonly 1.9 Earth-masses, it is the least massive exoplanet ever detected and is,very likely, a rocky planet,"said Xavier Bonfils of Grenoble Observatory inFrance, a member of the team that made the discovery, which was announced atthe European Week of Astronomy and Space Science at the University ofHertfordshire in the United Kingdom. The planetwas found in the famous system Gliese 581 and has been dubbed "Gliese 581e." It was detected using the low-mass-exoplanet hunter HARPS spectrographattached to the 3.6-metre ESO telescope at La Silla, Chile. Measurementswith the telescope also helped to refine the orbit of the new planet's solarsystem sibling, a planet called Gliese581 d, placing it well within the habitablezone, where liquid water oceans could exist. "Theholy grail of current exoplanet research is the detection of a rocky,Earth-like planet in the ?habitable zone? ? 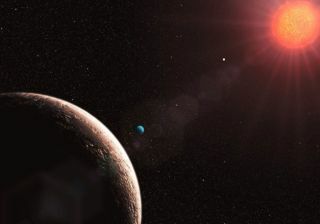 a region around the host star withthe right conditions for water to be liquid on a planet?s surface," saidMichel Mayor from the Geneva Observatory, who led the European team that madethe finding. PlanetGliese 581 e orbits its host star ? located only 20.5 light-years away in theconstellation Libra ? in just 3.15 days. Being so close to its host star, theplanet is not in the habitable zone. With thediscovery of Gliese 581 e, the planetary system now has four known planets,with masses of about 1.9 Earth-masses (planet e), 16 Earth-masses (planet b), 5Earth-masses (planet c), and 7 Earth-masses (planet d). "Gliese581 d, which orbits the host star in 66.8 days, is probably too massive to be made only of rocky material, but we canspeculate that it is an icy planet that has migrated closer to the star,"said team member Stephane Udry of Geneva University in Switzerland. ??D? could even be covered by a large and deep ocean ? it is the first serious'water world' candidate.? Low-massred dwarf stars such as Gliese 581 are potentially fruitful hunting grounds forlow-mass exoplanets in the habitable zone. The gravitational pull of orbitingexoplanets introduces a slight wobble to the star's motion. Because thehabitable zone of cool stars like Gliese 581 is so close to the star, theplanets within this zone exert a stronger pull, and so the wobble of the staris more pronounced, though detecting the signal is still a challenge. Over thelast two decades, scientists have spotted more than 300 extrasolarplanets circling other stars in our Milky Way galaxy. Most of these planetshave been about the size of Jupiter or larger. "It isamazing to see how far we have come since we discovered the first exoplanetaround a normal star in 1995 ? the one around 51 Pegasi,? said Mayor, whohelped find that planet. ?The mass of Gliese 581 e is 80 times less than thatof 51 Pegasi b. This is tremendous progress in just 14 years." The teamplans to continue looking for Earth-like, rocky planets around other stars. ?Withsimilar observing conditions an Earth-like planet located in the middle of thehabitable zone of a red dwarf star could be detectable,? Bonfils said. ?Thehunt continues.? And HARPSisn't the only instrument looking for low-mass, Earth-like planets. NASA's new Keplerspace telescope will also be peering through the galaxy in search ofsmaller alien worlds. It was launched on March 6 and sent back its first imageslast Thursday.